During his 12 seasons as a fullback with the Tampa Bay Buccaneers, 6-foot-1, 250-pound Mike Alstott was known as "The A-Train" -- a punishing runner and blocker and fan favorite. From 1996 to 2007, Alstott racked up an impressive National Football League resume: 5,088 yards rushing; 71 touchdowns (the most in team history); six Pro Bowls; and a Super Bowl championship ring in 2002. But the awards and accolades came with a price that's very familiar to many Americans: debilitating aches and injuries and a whole lot of pain medication. "One hundred million Americans suffer from chronic pain," said Dr. Anita Gupta, associate professor of anesthesiology at Drexel University College of Medicine in Philadelphia. "It's a really staggering figure that's been rising year after year, so that today there are more people struggling with pain than with heart disease, diabetes and cancer combined." The good news: Whether a professional athlete like Alstott or just a weekend warrior, pain sufferers now have access to more medication options than ever before. Often, such treatments take the form of prescription opioids -- also known as narcotics -- that include well-known painkillers such as OxyContin, Percodan, Percocet and Vicodin. The bad news: "Every day 44 people die from prescription opioids because they are not taking their medications safely," said Gupta. "And this is not a question of illicit use or drug abuse. Eighty percent of these deaths are unintentional and preventable. This is about very simple things, like not taking a medication as directed, or not understanding how multiple drugs can interact and cause problems, such as an accidental overdose." Underscoring the threat posed by improper use of potent painkillers, the U.S. National Vital Statistics System revealed this month that more American adults are now dying from prescription narcotics abuse than ever before. The analysis found that while 4.5 out of every 100,000 Americans died from a related overdose in 2003, that figure had risen to 7.8 by 2013. 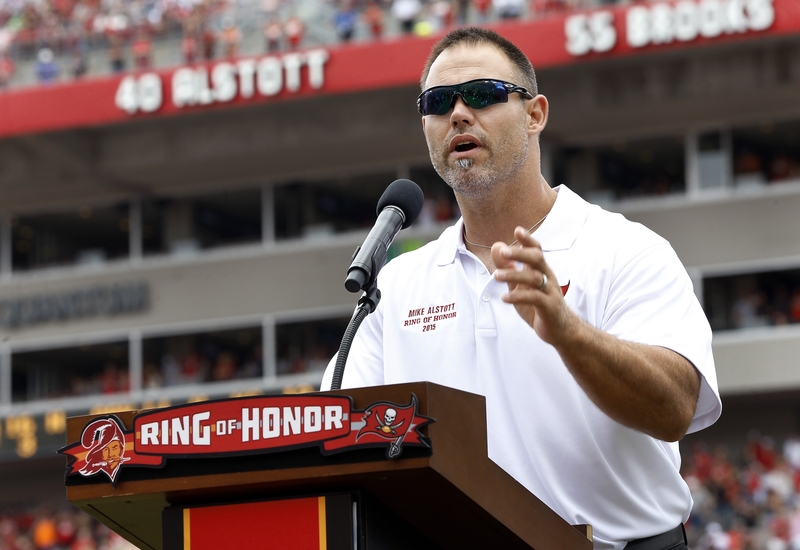 To address that growing threat, the 41-year-old Alstott, his playing days behind him, has taken on the role of pain educator, tackling the opioid problem head on as part of a new public information campaign titled "America Starts Talking." The initiative offers consumers access to online drug discussion guides and interactive education materials. It's a "do" and "don't" safety resource compiled in collaboration with the American Academy of Pain Management, the American Chronic Pain Association, The Pain Community, and the U.S. Pain Foundation. "I was very lucky," said Alstott, who now serves as head coach for a high school football team in St. Petersburg, Fla. "Yes, I experienced 47 documented injuries throughout my playing days. Which is a lot. And yes, I had to take opioids to manage the pain. But I always had people on my side who guided me through the process and were on top of me. And I always had consistency, as far as trainers and physicians, who helped me understand how to take them safely, as directed. So my experience was good." But Alstott knows that others might not be so lucky. "They might not know the risks. They might not be aware of the protocols. They might even be scared to talk it over with their physician. They might not know that drug poisoning deaths, primarily by prescription drugs, are the leading cause of accidental death in the U.S., surpassing motor vehicle collisions. "So we need an educated conversation about this," Alstott added. "We need to be upfront, and truthful, and help people be able to start the conversation with their doctors, so they can find out what they need to know." And that, he said, is where America Starts Talking comes in. "The discussion guides and information about opioids -- and also about how to respond if there's an emergency -- are not only for patients or doctors," Alstott explained. "They're also for loved ones, because they also need to be aware of the situation. I mean, I have three children. And I police any medication we give our kids. But if I don't know what I need to know and what to look for, that could be a problem." "So this is about getting information," he added. "And being prepared." The America Starts Talking campaign is spearheaded by the pharmaceutical company Kaleo, which makes an auto-injector called Evzio that's used to reverse the effects of an opioid overdose. © 2015 HealthDay. All rights reserved. This material may not be published, broadcast, rewritten, or redistributed. Gas prices continue skyrocketing across U.S.
More than 300 people were killed when several bombs went off in Sri Lanka on Easter Sunday. Now, ISIS is claiming responsibility in a video. Elizabeth Palmer has the latest. Gas prices keep going up. According to AAA, the national average is now $2.85 a gallon, up 23 cents from last month. But in California, drivers are paying more than $4 a gallon. Jamie Yuccas explains. A 24-year-old man from Wisconsin stepped forward Thursday to claim a $768 million Powerball jackpot. The prize is the third largest in history. "CBS Evening News" anchor Jeff Glor has more on the lucky winner. After months of speculation, former Vice President Joe Biden will finally launch his presidential campaign. It will start with a video announcement Thursday, followed by an official kick off rally next week. Ed O'Keefe reports.